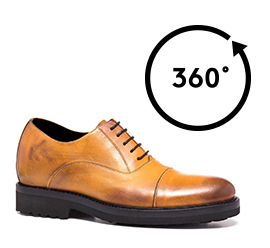 Refined handcrafted Oxford shoe with upper in calf leather buffered by hand to get the "burnished" vintage effect on the tip and the heel counter and hand stitching details. The lightweight rubber outsole provides a super comfortable fit, with welt in real leather and visible seams. A charming shoe with a vintage touch, essential to enrich your winter wardrobe. The invisible inner height increaser can be selected from 2.4, 2.7 or 3.1 inches.